Payphone TTY - Krown Manufacturing, Inc. 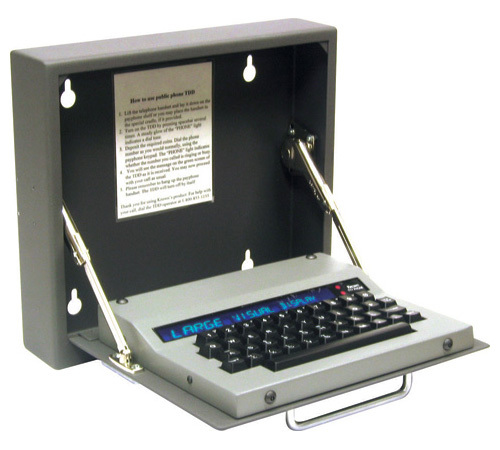 This low profile TTY may be mounted on an existing pay phone shelf with any available flat surface measuring 9.5″ W X 8.5″ L X 1.25″ H. The high-tech, stainless steel unit consists of a vandal-proof, sealed keyboard (to resist spilled liquids); bright, 16-character display screen; call progress indicator. This is a direct-connect TTY that is hard-wired through the tip and ring terminals of the public telephone. 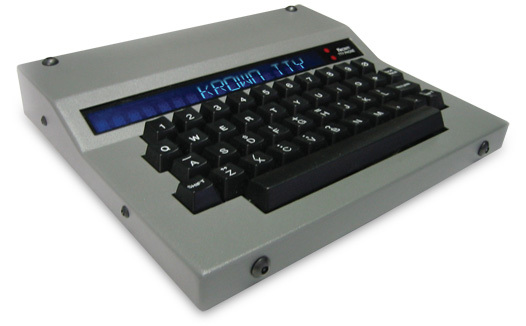 Simply press any key to turn the power on and proceed with the TTY call as usual. We can supply the cabinet enclosure at an additional charge. Public Phone TDDs meet a growing need. Installing a Public Phone TDD (Teletype) in your facility will give your many visitors who are deaf or hard of hearing access to the telephone. Efforts that began years ago with the installation of wheelchair ramps for access to public buildings now continue with the installation of Public Phone TDDs for access to public pay telephones. The people who use TDDs can have direct, reliable access to public telephones, a necessity that the hearing population takes for granted. Public Phone TDDs have been installed and are now working in airports, government buildings, hotels, police stations, hospitals, schools, shopping malls, apartments buildings, bus and train terminals and any place where there are public phones and people are aware of this available technology. Payphone Cabinet (Optional): Place the public TDD in a metal cabinet which provides extra protection for the product. The size is 12.5″ x 11.25″ x 2.25″. Add for $250.00. Note: The Public Phone TDD is a TDD (or TTY) which has been designed to work with any public telephone. TTYs are devices that people who are deaf, hard-of-hearing, or speech impaired use to make telephone calls. * All products from Krown Manufacturing Inc. will carry one year limited warranty against defects in manufacturing and workmanship.